This is Part 3 of my solution to The Merlin Mystery (“MM”) by Jonathan Gunson and Marten Coombe. This post looks at the 7 solids that appear on the shelf on page 4 (P4). They each represent a mini-puzzle that needs solving to reach the final solution. The 7 solids represent 7 steps required to solve MM. By itself, each solid is meaningless. But they are all linked, literally, to other objects throughout the book and these links give them meaning. The full sequence of solids is shown in order on a shelf near the top right of P4: Pyramid, Cone, Cube, Sphere, Cylinder, Cuboid, Diabolo. Note the colour sequence: white, blue, blue, white, white, white, white. This sequence is repeated in a book on P36,S26. The book is shown with a page half-turned over, with both visible pages being the same. The hint is that the steps represented by the solids should be taken on (almost) every page of MM. Line drawings of all 7 solids are also found in the sliding block puzzle on P18,S41. Each solid has a different colour background and the shelf order is maintained in the ordering of the 7 rainbow colours: red, orange, yellow, green, blue, indigo, violet (“ROYGBIV”). The rainbow at S38 is a reminder of the order. In the sliding block puzzle, the solids are split over three rows. This is supposedly* a hint that the first three steps (pyramid, cone, cube) are completed on a starting page. The sphere step, on the second row, is then completed on a second page before moving to a third page to complete the cylinder and cuboid steps. Finally, for the diabolo step, you return to the page you started from. *[I think this clue is misleading. The Cone appears in the first row of the sliding block puzzle. This implies that this step is performed on the starting page, but it isn’t. The Cone step is actually performed on the second page, so should be in the second row down. The Cube step is performed on the starting page and, worse, it happens before the Cone step. The order for these two steps is reversed from the shelf order and the sliding block puzzle is a muddle. When we get to this stage of the puzzle, I’ll explain what I think the relevant hints are to resolving this muddling of the logic. However, I’ll say now that I think it’s at best unfair and at worst an error. It leads you down a blind alley for the first 6 pages of the book before it’s possible to see that something is wrong. This is frustrating and totally unnecessary. Once the error is spotted, it is possible to work out that the Cube and Cone steps need to be reversed, but it requires a fantastic leap of faith and logic. I mention this now in case you’re trying to figure some of the puzzle out for yourself after reading my pointers. Just trust me that the cone and cube steps are reversed from what might first appear logical. Each of the solids appears in 3D twice in the book. First on the shelf on P4 and then on another page in the book linked to another object, usually with a gold ring. That object is then linked by a gold ring to another object on yet another page in the book. This final object is the “true meaning” of the solid. The pyramid link, in contrast to the other solids, is established in two different ways. First, on P4, a butterfly is sitting on the pyramid. It is very distinctive with a Nim symbol on each wing. The markings are more obvious on the larger version of the butterfly which sits on S0. A silver Nim symbol is placed just below the butterfly to make the connection even more obvious. The second method is the standard linking method for all the other solids. The pyramid appears again on P24,S38 where it is linked to an incense burner with a gold ring. The incense burner appears again on P6,S40 where a gold ring links it to an open book with two Nim symbols on it. The pyramid is linked to the Nim symbol. The second appearance of the cone is on P16,S38 where it is attached to a golden eagle via a gold ring. The golden eagle appears again on P18,S16 where it is attached to a picture of a plane, specifically a spitfire. The picture also feautres a pilot with a Mer symbol on his hat. The Cone is linked to the spitfires and to the Mer symbol. The second appearance of the cube is on P10,S13 where it is attached to a “Red Baron” plane. The Red Baron appears again on P18,S38 where it is attached to an open book with silver Merlin (SMer) symbols on the left page and GMer symbols on the right. The left and right pages of the book are partly turned over. The cube is linked to the gold and silver Mer symbols and a book with turning pages. The second appearance of the sphere is on P34,S1 where it is attached to a telescope. The telescope appears again on P24,S8 where it is attached to an open book with the first Cadency symbol (C1) appearing in gold on the left side and silver on the right side. Again, left and right pages of the book are partly turned over. The sphere is linked to the Cadency symbols and a book with turning pages. The second appearance of the cylinder is on P38,S28 where it is attached to a knife. The knife appears again on P20,S19 where it is attached to an open book with a large moon on it. The knife appears several more time through the book and has one or two owls sat on it: P18,S30 and near the bottom left corner of P22, for example. The owls also often sit on moons: P22,S17 and P10,S27 for example. The cylinder is linked to the moon symbols and the owls. The second appearance of the cuboid is on P20,S26 where it is carried by a beefeater. 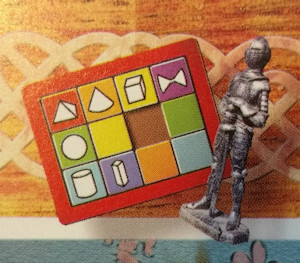 The same beefeater appears against on P30,S30 where it is holding a blank copper tile. Two other beefeaters stand either side of a green door on P18,S25, one carrying a clock with a red banner, one carrying a clock with a green banner. These banners are seen again on P18,S28 and P16,S27 where they feature Mer and Nim symbols. The cuboid is linked first to the copper tiles and, second, to the Nim and Mer symbols. The second appearance of the diabolo is on P18,S7 where it is attached to a statue of Mr Punch. Mr Punch appears again on P30,S45 where he is attached to an open, blank book. The right page of the book is partly turned over. The diabolo is linked to a book with a turning page. Though the links from solids to symbols are quite easy to find, the meanings of these symbols are much harder to decipher. Each requires a full post to explain and the next part of the solution will cover the Pyramid puzzle. Before reading on, consider that the different symbols in the book have now been split into 7 different categories. There is some overlap but, by and large, it is possible to focus on these 7 categories separately to start sorting through the mess of symbols and look for patterns and other connections. For the Pyramid puzzle, look out for the silver Nim symbols that appear just inside the border on every page except the first and last. They appear next to different squares on each page. Can you spot a pattern? What other symbols is the Nim symbol linked to and can you spot any patterns there?